electroBlast now has the Exclusive Endorsement of Nationally-Acclaimed Water Expert, Steven Clarke & World-Renown Dr. Howard Peiper, N.D. in their new book: H2 WATER 4 LIFE. 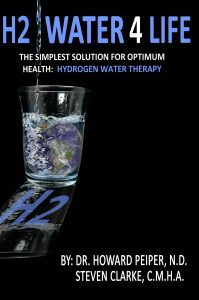 www.H2Water4Life.com. ElectroBlast folks helped write the special chapter “Understanding Electrolytes” which outlines why you need more than just the sodium and potassium found in many sports drinks. Check it out!